Shelton, Conn. – March 29, 2019 – Hubbell Wiring Device-Kellems redefined the benchmark for motor disconnect safety with its inSIGHT™ phase-indicating technology. Six LEDs (3 line side/3 load side) incorporated into the cover providing users critical information. This inSIGHT™ phase-indicating technology is now available in 30A, 60A and 100A. The integral LEDs provide both safety and convenience benefits. Electrical status of each phase is now within sight and clearly displayed on the cover. Users are provided a secondary way to visually confirm make/break on all phases. Furthermore, the LEDs provide insight about the electrical status of the switch within the enclosure prior to removing the cover. Personnel can quickly and safely identify abnormal conditions such as a welded contact or dropped phase. The inSIGHT™ clearly differentiates itself with features you can literally see. inSIGHT™ disconnect Switches are available in non-metallic and stainless-steel versions, with or without a jog switch. For retrofit applications, replacement covers are available to use in existing installations. 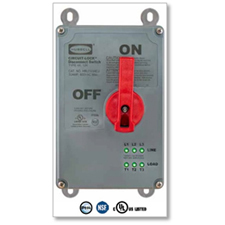 When locked in the “off” position, the high-visibility red rotary handle complies with OSHA lockout/tagout requirements. When in the “on” position, the cover cannot be opened. The disconnect switch’s IP69k rating means that it can withstand high-pressure, high-temperature washdowns. It is also certified for use in food processing applications by NSF, and is UL Listed for Type 4X and 12 enclosures. For more information about Hubbell’s Circuit-Lock Disconnect Switch with inSIGHT technology, contact your Hubbell sales representative or visit www.hubbell-wiring.com.